A number of hardbound books and Journals are available to assist and educate collectors of Barber coinage. This page is an attempt to capture the most popular reference books and resources. Lawrence, David. The Complete Guide to Barber Dimes. 1990, DLRC Press. Lawrence, David. 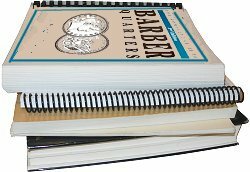 The Complete Guide to Barber Quarters, Second Edition. 1994, DLRC Press. Lawrence, David. The Complete Guide to Barber Halves. 1991, DLRC Press. Feigenbaum, David Lawrence, and Feigenbaum, John. The Complete Guide to Certified Barber Coinage. 1997, DLRC Press. Peters, Gloria, and Mohon, Cynthia. The Complete Guide to Liberty Nickels. 1995, DLRC Press. Bowers, Q. David, A Guide Book of Barber Silver Coins. Whitman Publishing, 2015. Flynn, Kevin, The Authoritative Guide on Barber Dimes. Self published, 2004. Flynn, Kevin, The Authoritative Guide on Barber Quarters. Self published, 2005. Flynn, Kevin, The Authoritative Guide on Barber Halves. Self published, 2005.